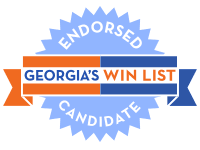 Georgia’s WIN List is proud to endorse Joyce Barlow for House District 151, a sprawling rural district stretching across nine of Georgia’s western border counties south of Columbus. The district is one of the state’s most “flippable” and the GOP incumbent, a party-switching former Democrat who has served more than 30 years, is one of the state’s most vulnerable in the pale male patriarchy. Trained as a Registered Nurse, Joyce Barlow has demonstrated her care for others and concern about the needs of her district with more than 25 years as the owner of a health services agency, Englewood Health Care. Her agency provides quality in-home health care to citizens in more than 70 percent of the HD 151 counties. She has also served on a local bank board and is a former vice chair of the Albany Chamber of Commerce. She is no stranger to the Georgia Capitol, having spoken before legislative committees about the lack of affordable health care in rural Georgia and bringing attention to the closing of rural hospitals in the district. She was instrumental for the work of state-level committees which established new state rules and regulations for personal care homes, assisted living facilities, proxy caregivers, and Georgia’s Alzheimer’s initiative. She has also participated in state-level initiatives on funding and often serves as a spokesperson for the needs of Southwest Georgia. Her reputation as a hard worker with the heart and intelligence to “get the job done” is evidenced by the many awards she has received including the 2016 Distinct Award for Servant Leadership from the Georgia Women’s Legislative Caucus and the 2011 Dream Award. She is a former president of the local Alpha Kappa Alpha Sorority and former president of the Albany Chapter of the Links, in addition to many healthcare group offices and affiliations. Work to expand Medicaid which would offer coverage to thousands of Georgians and fund more preventive care. Stop the closing of our rural hospitals and provide winning solutions for health care delivery in rural areas, including clinics in each rural community and streamlined services for those with chronic conditions. Promote economic development by working to retain the businesses and work to attract more and diverse small businesses to the area. Address the growing violence by working to support programs which identify the need for early intervention and teaching for troubled youth. This work will be closely coordinated with local law enforcement and the community. Georgia women like Joyce are making history in this midterm election cycle as they run for seats long held by Republicans. With women in record numbers on the ballot this year, WIN List needs your help to elect these women and train the candidates we want to see on the ballot in 2020 and beyond.